Notes: Hearts, while not trump, award one penalty point each, hence the game's most common name. Hearts is an "evasion-type" trick-taking playing card game for four players, although variations can accommodate 3-6 players. The game is also known as Black Lady, The Dirty, Dark Lady, Slippery Anne, Chase the Lady, Crubs, Black Queen and Black Maria, though any of these may refer to the similar but differently-scored game Black Lady. The game is a member of the Whist family of trick-taking games (which also includes Bridge and Spades), but the game is unique among Whist variants in that it is an evasion-type game; players avoid winning certain penalty cards in tricks, usually by avoiding winning tricks altogether. The game of Hearts as currently known originated with a family of related games called Reversis, which became popular around 1750 in Spain. In this game, a penalty point was awarded for trick won, plus additional points for capturing the Jack of Hearts or the Queen of Hearts. 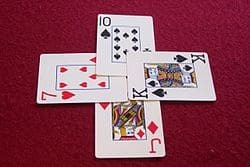 A similar game called "Four Jacks" centered around avoiding any trick containing a Jack, which were worth one penalty point, and the Jack of Spades worth two. Over time, additional penalty cards were added to Reversis, and around 1850, the game gave way to a simple variant of Hearts, where each Heart was worth 1 point. The Queen of Spades (sometimes referred to as "Calamity Jane") was introduced in a variant called Black Maria which then became known as the standard Hearts game, and soon thereafter, the idea of "shooting the moon" was introduced to the game to add depth to the gameplay. In the 1920s, the Jack of Diamonds variation (ten positive points) was introduced, and some time later the scoring was reversed so that penalty points were expressed as positive instead of negative. Passing cards, breaking Hearts, leading the Two of Clubs, and "Shooting the Foot," whereby a player attempts to Shoot the Moon, but succeeds in taking the Queen and all but one heart, are more recent additions. The game has become popular in live play among grade school students in Canada, and has increased in popularity through Internet gaming sites. It also became known through the Microsoft version of the game packaged with most 1990s workstation versions of its Windows operating system, beginning in version 3.1. The overall objective is to be the player with the fewest points by the end of the game. Thirteen cards are dealt to each player. When there are only three players, the 2♦ is removed from the deck before play commences, and each player receives 17 cards. In another alternative, a randomly chosen card is set aside face down at the beginning of play (the "Kitty"); this card goes to whoever takes the first Heart or, alternatively, the first trick. When there are five players, the 2♣ is removed as well as the 2♦, and each player receives 10 cards. Alternatively, three Jokers (usually the two from one deck plus one from a similar deck) can be added, and each player receives 11. In another alternative, two randomly chosen cards are set aside face down at the beginning of play; these cards go to whoever takes the first heart. When there are six players, two jokers are inserted and each player receives eight cards. When there are more than six players, two decks may be used, with cards removed or jokers added to ensure an even deal. The basic game of Hearts does not include card passing, but the most common variants do. Before each hand begins, each player chooses three cards, and passes them to another player. The main objectives of passing are to try to become "short" or "void" in a suit, and thus able to play off-suit when that suit is led; or to rid one's hand of "dangerous" cards that will likely force that player to take a trick containing penalty points, such as the Ace, King, or Queen of any suit (especially Spades and Hearts). There are many variations on passing; the most common (popularized by computer versions) rotates passing through four deals; on the first deal, players pass to the left, the second deal to the right, the third across the table. On the fourth deal no cards are passed; the cycle of four deals is then repeated. Subsets of the four-deal passing sequence may occur, such as only passing in one direction, or passing alternately left and right. When playing with an odd number of players, passing across is not possible. With five players, the players may choose only two cards, and pass one each to the two players situated closest to the exact opposite side of the table. This system is called "star-passing" because the pattern of passing routes forms a five-point star. Alternatively, with an odd number of players, players choose three cards and discard them to a central pile. The Dealer then gathers, shuffles, and re-deals these cards. This method is known as a "center mixer". Passing the A♠, K♠ and/or Q♠ may be prohibited. When there are more than four players, only two cards can be passed. The dealer chooses the number of cards to be passed and the direction of passing. An example trick. South has led the J♦, and takes this trick (which includes a penalty Heart). In this case, no other player had a ♦. The game is played like most other trick-taking games. The first trick is led by the player to the left of the dealer. Each other player, in clockwise order, then plays a card from their hand. Players must follow suit; that is, play a card of the same suit as the lead card, if they are able. If they are not able to do so, they can play any card (an action known as "sloughing" or "discarding"), including a penalty Heart or the Queen of Spades. The trick and any penalty points it contains are won by the player who played the highest-value card of the suit that was led. That player then becomes the lead player for the next trick, and play continues until all players have exhausted their hands. (roughly 1 in 45 billion). This becomes more likely when other penalty cards are introduced as part of a variant. Hearts cannot be led until they have been "broken" (discarded on the lead of another suit), unless the player who must lead has nothing but Hearts remaining in hand. In some variations, any penalty card, including the Q♠, can break Hearts. In a sub-variation of the above, if a player's hand contains nothing but Hearts and other penalty cards, even if Hearts have not been broken, the player can lead a Heart. Hearts are of course broken by this play. Two distinct Jokers are designated as the zero of Clubs and the zero of Diamonds, and behave just like ordinary Clubs and Diamonds. Non-distinct Jokers are valueless cards that cannot win tricks. They may be played at all times (except to lead tricks), or perhaps only when following suit is not possible. Jokers may also be considered as penalty cards. They may behave as normal penalty cards, or they might only score if played to a Heart trick. Jokers may be allowed to lead. If they are, the leading player calls a suit which must be followed, or the lead suit may be determined by the next card played. If the game uses multiple decks, and two identical cards tie for taking the trick, the most recently played card takes precedence. Cancellation Hearts (see the Variations section) defines different behavior involving identical cards. Each Heart taken in a trick scores one penalty point against the player winning the trick, and taking the Q♠ costs 13 penalty points. There are thus 26 penalty points in each deal. The game usually ends when one player reaches or exceeds 100 points, or, in some variations, after a predetermined number of deals or period of time. In any of these cases, the winning player is the one with the fewest penalty points. It is also possible to score with chips. All players contribute one chip to a central pool of chips. The pool is divided equally among those players taking no penalty cards on a deal; if all players take penalty cards, the pool remains on the table and is added to the next pool. Once one player has won all available chips, or once another player has run out, the game ends. The J♦ is a "bonus" card, subtracting 10 penalty points from the player who captures it. This is called the "Omnibus" variant. The bonus may or may not be allowed to "carry"; that is, the bonus may not be allowed to produce a hand score, and/or a running total, of less than zero for the player capturing it. Higher penalties may be assigned for the high Hearts, e.g. J♥ = 2 points, Q♥ = 3 points, K♥ = 4 points, and A♥ = 5 points. 2♥ = 2 points, 3♥ = 3 points, 4♥ = 4 points, etc. ; the Jack, Queen, King, and Ace are worth 10 points each, and Q♠ = 25 points. The penalty cards then total to 119, similar to Schwarze Katze. Same as above, but J♥ = 11 points, Q♥ = 12 points, K♥ = 13 points, and A♥ = 14 points; Q♠ has no value. This variant is called "Pip Hearts". Additional penalty cards may include A♠, K♠, and 10♠. The 7♣ is worth seven points in a variant called Hooligan Hearts. Players reaching exactly 50 or 100 points at the end of a round may subtract 50 points from their scores. Players who take no tricks in a deal may subtract five points from their scores. Before the first trick in a round, a player may predict that he or she will not take any Hearts on the upcoming hand. If the pledge is successful, 10 penalty points are deducted, but 10 points are added if it fails. Shooting the moon, also known as getting control, capmangoe, or running, is a very common scoring variant. If one player takes all the penalty cards on one deal, that player's score remains unchanged while 26 penalty points are added to the scores of each of the other players. This is known as playing by "Old Moon" rules. In the "New Moon" rules, the player subtracts 26 points from his or her own score instead of adding 26 to the others. Attempting to shoot the moon is often a risky strategy, as failure to capture every single penalty card will result in the remaining penalty points (as many as 25) being added to one's score. A player who shoots the moon may have a choice between Old Moon or New Moon. A player who shoots the moon may be required to use the Old Moon rules, unless doing so would end the game with the shooter losing (e.g., in a 100-point game, if the shooter has 90, another player 95, and the leader 63, adding on a moon would sink the shooter). In such a case, the player may use New Moon instead. A player who shoots the moon may only use New Moon after he or she, or perhaps another player, has reached a predetermined score. A player who takes all thirteen tricks, thus shooting the moon, may add 52 points to the other players' scores, subject to the other variations listed above. This is known as "shooting Pluto", "shooting the sun" or "shooting the blue moon". A player who takes all thirteen tricks may add 52 points to the player who passed to him or her at the beginning of the round, while the others each receive 26. This is known as the "Punishment Rule". A player who takes all thirteen tricks reverts their score from the entire game to 0. This is known as "Cleaning the Slate". A player who takes all of the penalty cards but fails to shoot the sun scores normally instead of shooting the moon. The first trick of a hand does not count for shooting the sun; only the following twelve tricks are required. This allows a player who holds the two of clubs to shoot the sun. If a player receives 260 points (26 points every round) over ten rounds, all other players may receive 260 points and the player finishes with a score of 0, or all other players receive 100 in a normal game. This variant is called "Shooting the Big Moon". "Booster Nines": If a nine is played, the trick is extended by one round. "Complex Hearts": A variant by game designer Richard Garfield using the complex number system. Hearts are worth one point each, Q♠ = 13i, J♦ = -10, and 10♣ multiplies the score for the given hand by 2i. The first player to reach an absolute value of 100 is the loser. "Danger Hearts": Ten rounds are played using standard scoring, and each player has three lives. If a player receives 15 or more Points in a round, he or she loses a life. "Cancellation Hearts": For 5 to 11 players, using two decks shuffled together. If exactly the same card is played twice in one trick, the cards "cancel" each other, and neither can win the trick. If two of such pairs appear in the same trick, the whole trick is canceled and the cards are given to the winner of the next trick. "Gong Zhu" or "Chinese Hearts" (拱猪) (Pinyin - gŏng zhū, literally "chase the pig"): Cards have negative values instead of positive penalties. 5♥ through 10♥ = -10, J♥ = -20, Q♥ = -30, K♥ = -40, A♥ = -50, Q♠ = -100, J♦ = +100, and 10♣ doubles the score for the round. "Joker Hearts": One or more Jokers are added, which can be played any time (regardless if following suit is possible). They cannot win tricks or score any penalty points. "Likha": A Middle Eastern variant. It is played with partners who sit across from each other strategically playing to feed their opponents points. Both the Q♠ and the 10♦ are referred to as the "likha". Q♠ is worth 13 points, 10♦ is worth 10 points and every heart is worth only 1 point. The game is played up to 101. Each player's points are scored individually. Whichever player reaches this score first, that team loses. If two or more players from opposite teams go over, then the one with the higher score loses. Shooting the moon inflicts a 37-point penalty instead of an award. "Partnership Hearts": Players seated opposite each other form two-person teams. Team members combine their scores. A team that successfully shoots the moon causes the other to earn 52 penalty points. "Queens": All Queens are worth 13 points; the game ends when a player reaches 108. Hearts can be led at any time, and penalty cards can be played on the first trick. Shooting the moon inflicts the normal penalty instead of an award. The dealer of each round is the player who received the Q♠ in the previous round. "Rickety Kate": Exactly the same as Hearts, minus shooting the moon, as named in Australia. "Royal Hearts": A game produced by Parker Brothers. The Q♠ is worth 26 points instead of 13. Q♥ doubles the point value of all Hearts taken by that player. Q♦ is worth −10 points, and Q♣ negates the Q♠'s point value if both are captured by the same player. "Small Hearts": The 2s through 7s of each suit are taken out, forming a piquet pack. The 8♣ leads. Each Heart is worth one point, the Q♠ is worth seven points, and J♦ is optionally worth −5 points. Shooting the moon awards −14 points. With the exception of trying to shoot the moon in Hearts players attempt to discard high cards without winning points. This can either be accomplished by creating a void or playing the last card in a trick that has no points. In general it is advantageous to play the highest card possible without winning the trick. Players particularly concentrate on getting rid of high cards in suits that they do not have padding low cards in. For example, if a player had the 2,3,4,5, and Ace of spades the ace would not be much of an issue, because they can play the 4 lower cards before they will be forced to play the Ace. In contrast if they only had the Ace of spades then they would be forced to play the Ace the first time spades were led. A void is when a player does not have any cards of a certain suit. Generally this is a highly advantageous situation because it prevents the player from winning any points in that suit, and provides a means to dispose of poor cards. These can be intentionally created with good passing strategy, or appear by themselves. If a player does not have the Ace, King, or Queen of spades it is to that player's advantage to play spades to try to force the Queen of Spades onto another player. Shooting the moon can rapidly change the direction of a game in a player's favor, however it is also very risky. A good hand for shooting the moon should contain significant high cards, in addition to a long run of a single suit that can be used to keep the lead once the other players have run out of that suit. In general when passing the player is trying to both get rid of bad cards, and create voids to get rid of bad cards they may receive. The Ace and King of spades are two of the most important cards to get rid of because they are higher than the Queen of Spades. In addition high hearts can be dangerous. When creating voids, it is best to do that in either clubs or diamonds, because players want to avoid receiving high hearts or spades without having any padding.